It's been a while, I'm sure some of you are wondering where on Earth I've been! What a huge show! We were accepted into the Indie MEGABOOTH, the awesome showcase of indie games that has grown and grown and now carved out a sizable portion of the main hall. We were up towards the back, but we had an open corner which made it easy for people to crowd around - and crowd they did! We ran three setups - one off laptop, one off a borrowed Alienware PC and a PS4 build running off a loaner kit from Sony. We had a lot of people through across the four days, including game development inspiration and fellow first name wielder Tim Schafer, who only I got to meet due to that monkey paw wish I made before the show. Our booth neighbours were Juggernaut Games showing their scifi RPG Star Crawlers. Seattle was a great place to visit, PAX Prime was awesome and the whole experience is hard to top! You'd have to go show the game in Japan or something! So we were accepted into the Tokyo Game Show indie games area. Through a well timed 2 for 1 ticket sale, I ended up being able to tag along with Sanatana and sleep on the floor of a friend of a friend's house an hour's train ride away from the venue. While our space at the event was a whole lot smaller, it was an excellent location, on the edge of the indie area and facing out to Capcom and Square Enix's stages. Tokyo Game Show is a four day event divided up two developer days and two general public days. The developer days were pretty busy then the whole thing went a bit Dead Rising. Thanks to Playism taking pity on some lost Australians trying to show their game in a non-English environment we ended up with enough translation to get by and I only introduced one major bug hooking it all up (and one major oversight - O button means accept in Japan) which I managed to fix via hasty laptop hacking on the first night. We were fortunate enough to catch up with Cara Ellison, the talented globe trotting writer, game critic and voice of our eighth android, Peanut! Our booth neighbour was Willy Chyr showing his gravity skewing brain bending exploration puzzle game RELATIVITY. I also caught up with experimental presentation format PechaKucha and gave a short, slightly awkward sounding recap of how Witch Beam came to be live from the show floor! While there were no shortage of people assuring us the game would be perfect for Japan I was pretty nervous personally - Cactus might be draped in Japanese gaming tropes but would it feel at home or come across like an awkward imitation? Luckily the reception was good and despite a few things we haven't seen before (players expertly weaving between bullets but not using the right stick to aim at all, and no natural tendency to jump in as the extra player with a stranger) the response was familiar and we were even nominated for awards! Take THAT, cultural barriers! In terms of lessons learned, we were very happy we had a localised build. While translators were about and there were plenty of English speakers, trying to explain game systems across a language barrier would have been tricky. Where we fell down was not having clear signage! Our poster was made and printed up at the last minute and while it came out looking great, what it could have done with was some info on the game. Genre, who the team is, the platforms it's coming out on and release date are all key pieces of data people want, and it would have been better if they'd been displayed in English and Japanese. The Nerd Culture Expo on the Sunshine Coast may have lacked the ridiculously huge set pieces of PAX Prime or the massive stages and sheer numbers of attendees of Tokyo Game Show but it had something neither of those big shows with their fancy budgets had - an indoor wrestling ring. A fun and easy going one day convention that comfortably filled a gymnasium, I had a good time showing people the game, watching the LARPers outside hit each other and chatting with people about game development. Our booth neighbour was our friends Disparity Games showing off Ninja Pizza Girl! We also hosted a panel together to honestly describe what making videogames is like for anyone considering the career in hopes it would scare them straight. This was a big deal for us! 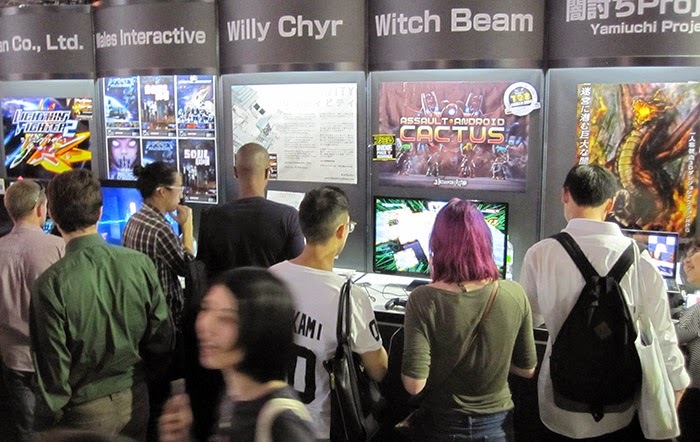 We were chosen as one of the six games featured in the Australian Indie Showcase which was not just an honour but a chance to carve it up on Australian soil in a kickass booth location facing out into the Indie Pavilion. It felt like a great big celebration of Australia's indie game talent and there sure is a lot of it these days! So many familiar faces and met a bunch of new devs, it was really awesome! Our setup was a loaned Alienware PC and the PS4 build. Tycho turned down a Steam code insisting he would buy the game. Which means he really liked it or really hated it! Our booth neighbours were Thomas Janson showing his reflex taxing iOS action game Wave Wave and Chris Johnson showing his transcendent polar coordinate based maze and music experience Expand. ... so why do we do this to ourselves? So it's cool and all but these shows are hard and physically taxing. Work stops, and even though we try to it on the cheap, costs accumulate quickly. It's great to meet fans (new and existing!) devs and some of the people we do business with face to face but how do we know if it's working? 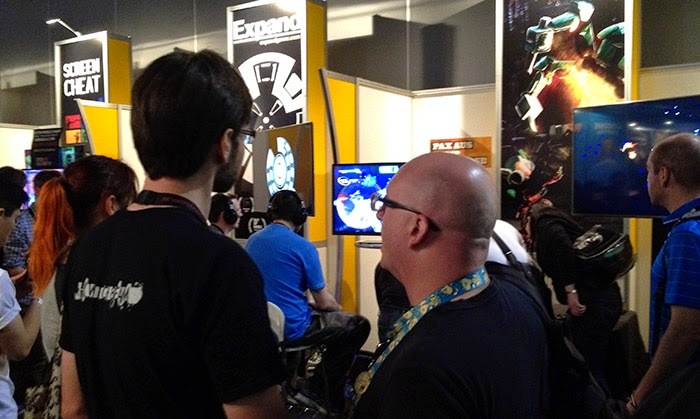 We're reaching people, even if it's one person (or in some cases, 10 people) at a time, and for the most part we take it as it comes - we could only do PAX Prime because the Indie MEGABOOTH offer lined up with an available travel grant, if the timing had been different Tokyo Game Show never could have happened, and it feels wrong to let these opportunities slip by. On the other hand, any time I'm on a plane or away from home I'm not arting or coding and Cactus is formed largely out of a substance I like to refer to as "artcode". Showing the game in public has definitely improved our confidence in our work, helped us shape and better understand our "sales pitch" and given us valuable insights into how people see and initially respond to the game. Sometimes it lets us put features in front of people that aren't quite ready to go in Early Access! Peanut has been in the convention builds for a while now and we were able to show an early version of the Stage Select ahead of its unveiling. Doing these events might not translate into sales surges, or, uh, sales in general, but I'm hopeful these experiences, as well as being exciting in of themselves, are paving the way for our future. It's just that they're costly (in every sense of the word) and must be weighed and considered carefully. And what better place to make weighted and carefully considered decisions than in Vegas! 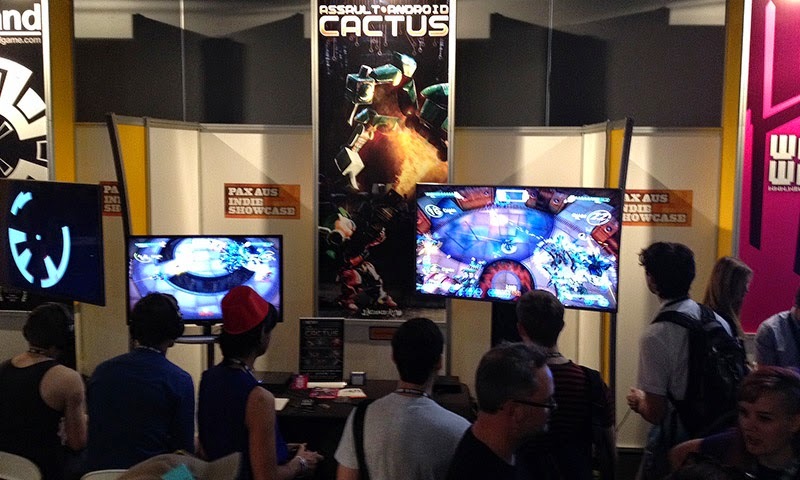 Next month I'm heading back to the USA to show Assault Android Cactus running on PS4 for Sony's inaugural two day community event!